There’s a lot of people who assume that the line in my bio about being an international-class pro Rock Paper Scissors referee is a witty bon mot. 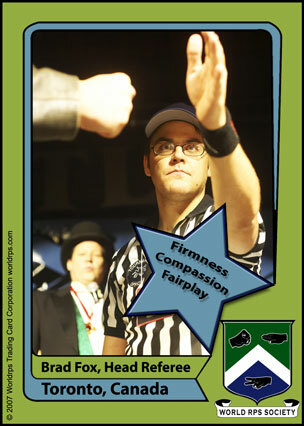 But last time I checked, wry web-irony didn’t come with one’s own trading card. My favourite weeked of the year is here as it’s once again time for the 2008 World Championships of Rock Paper Scissors… sorry I guess that’s the Yahoo! 2008 World Championships of Rock Paper Scissors (whew). I’m not sure I could even begin to go into my shady history with the infamous World Rock Paper Scissors Society, but suffice it to say – there are certain… acts… that in retrospect would have made everyone’s live’s easier had I done them under a nom de guerre. If you are in the Toronto area you really deserve it to yourself to come out on Saturday for the spectacle, the pageantry, and the chance to walk out of the place $10,000 richer and a bonna fide world champion. I promise you this – you have never (nor will you ever) see anything else like it in the world, and it is the finest athletic event over which I’ll preside as head referee this year. See you all on the far side of the festivities!